Inhabitants of H&H Bar. #1956.069.004. 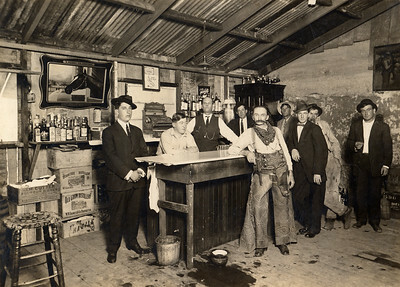 Nine men gather at H&H Bar on Monterey Street, owned by Clarence Hunsaker: Lealdo Chiesa, Sal Sada, Paul Sada (Slim Hunsaker), Eddie Bean, and Bill Beatty. 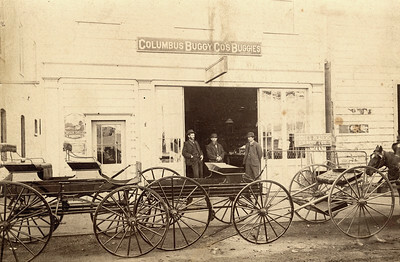 Exterior of Columbus Buggy Company, on the corner of Morro and Monterey Streets, with men and buggys in front. William Sandercock in front of Sandercock Transfer Company building, 1880-1889. #01.01.3654. 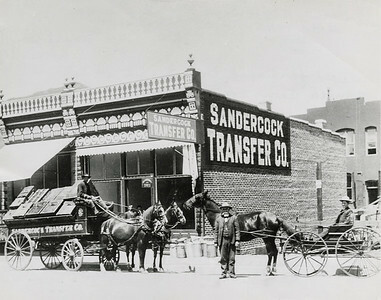 Sandercock Transfer, Co. Founded in 1872. 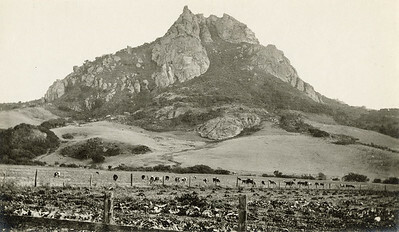 William Sandercock, Founder - standing in center of photo by horse. 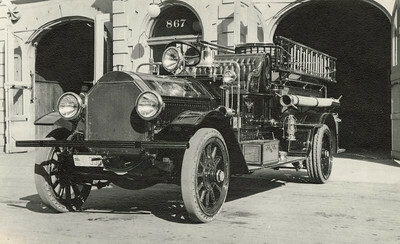 The first Fire Department of San Luis Obispo City was on the ground floor and the City Hall was upstairs. 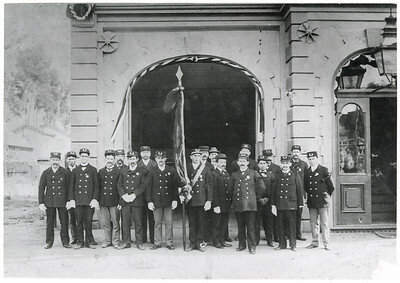 Tiger Hook and Ladder Company in uniform in front of San Luis Obispo Fire House at 867 Higuera Street, 1879-1916. 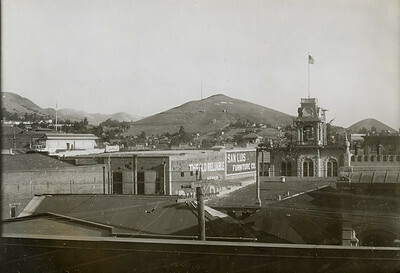 Visible are the Elmo Theater, San Luis Furniture Company, and the original fire station. 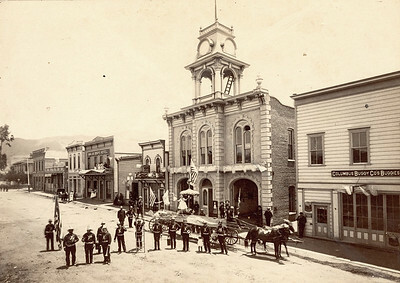 Combination fire house and city hall, opened May 18, 1879. 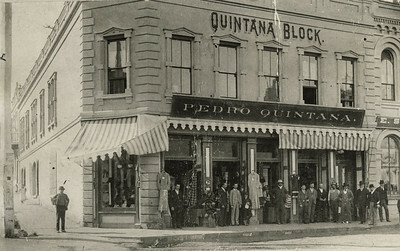 San Luis Obispo Dollar Days on Higuera Street. Visible businesses include: Anderson Hotel, Sears Roebuck and Co, Montgomery Ward, Copeland's Buster Brown Shoes, Mercantile Acceptance Company Loans, Gallen Kamp's Shoes, Maddalena's Tires, and Fremont Theater (in background). 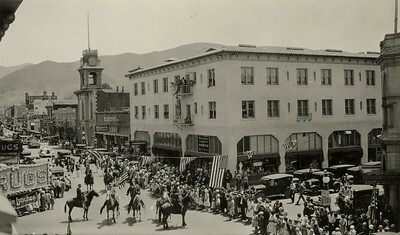 Equestrian unit leading La Fiesta Parade on Monterey Street. 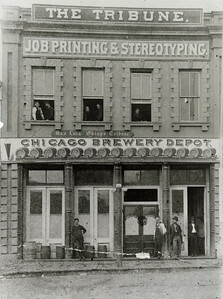 Several businesses identifiable including Wineman Hotel Building (ocupied by Renetzky's Shoes, Carpenter Drug Store, and other businesses), original City Hall/Fire Department . 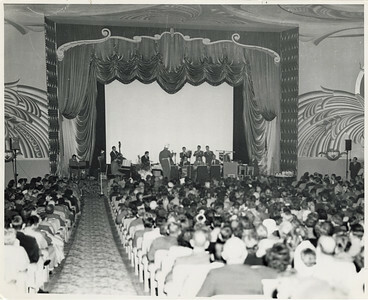 Fremont Theater interior with a orchestra playing and large audience. 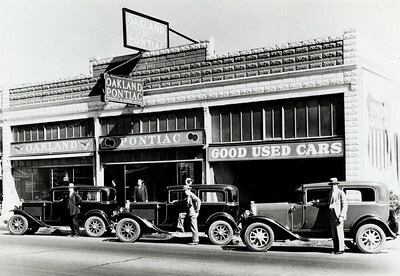 647 Higuera Street, Oakland Pontiac automobile dealer. Now (2017) the site of Aaron Brothers Art Mart. Later Oakland Pontiac moved to 990 Higuera. 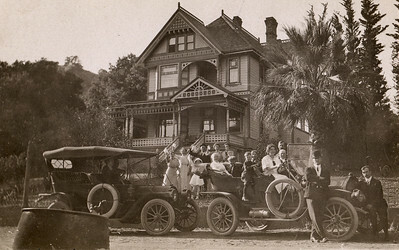 Lyman-Nevada House at foot of Cuesta Grade with two automobiles and Lyman family in front of house. 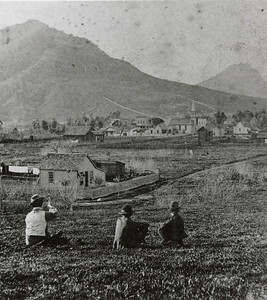 View of early San Luis Obispo looking northwest. Three males seated in the foreground. The old Methodist church on Garden St. is visible. 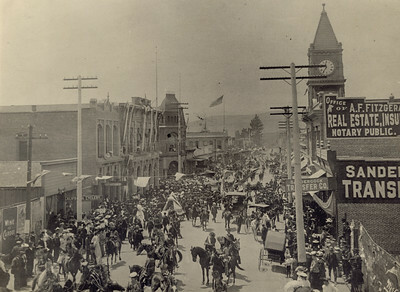 Celebrants include horsemen with sashes, carriages, crowds spilling off sidewalks into the street, and organized marching units in background. Flags strung over street. Several buildings and businesses identifiable including: Sandercock Transfer Co., A.F. 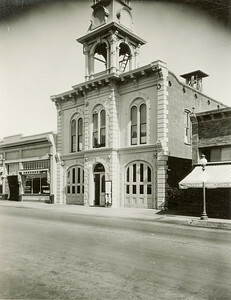 Fitzgerald Real Estate, California Cyclery, Commercial Bank, and City Hall/Firestation. Poster for McElree's Wine of Cardui (folk medicine). 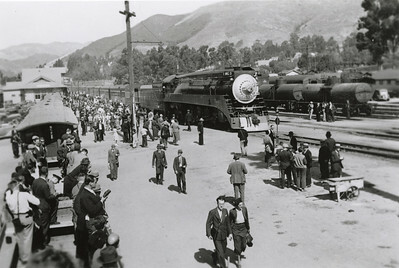 Southern Pacific Train Depot in San Luis Obispo, 1938. #1955.015.006. Pacfic Coast Railway and Southern Pacific trains at San Luis Obispo Southern Pacific depot. 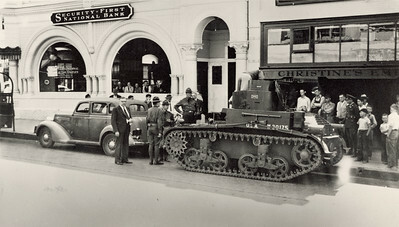 USA Military tank in front of Security First National Bank, c 1940s. #1990.037.005. USA Military tank W30175 in front of Security First National Bank, corner of Chorro and Higuera Streets. Lucien de Fossett in suit in street. 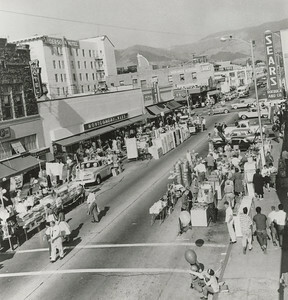 Christine's Emporium (787 Higuera Street) also visible.